Android Pie For Android One Moto X4? When can we expect Android Pie for the Android One Moto X4? I doubt anyone here knows when. That's the answer I got when I asked suport. So winter dont start until what December 21. Lets hope before that. 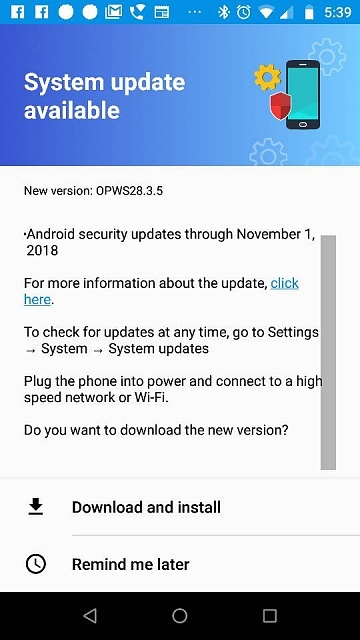 I just got an update on my phone today but it was only the October 2018 security update. No pie as of yet. Just got the same update. Still no Pie but this updated just popped up... November 1 2018 security update. At least they are keeping the phone updated. Again better than LG did with my G5 and that was a more expensive phone. Just got the November update also. No Pie yet but the technical term for when it is going to be released is 'soon'. Pie update rolling out in Brazil. XDA-Developers: Moto X4’s stable Android Pie update rolling out in Brazil. Just received on my X4, no issues so far, about 45 minutes total to download and install over a decent WiFi connection. Got it two days ago. Works great. Yes it works well besides a few user interface quirks it seems like a good release. I'm not sure if I'm hallucinating or whether my phone now lasts a bit longer than on Oreo. Overall quite happy. Did not really expect Pie update so soon as Motovo is known for being very late on updates.